OCTAL, FrieslandCampina, and Südpack establish a relationship aimed at reducing packaging waste without compromising packaging quality. Recycling of plastics – one of the best ways to reduce a carbon footprint — offers two major benefits: reduction in the amount of oil required to produce more plastic; and reduction of material going into landfills. Consequently, progressive food and packaging manufacturers are always searching for efficient ways to produce containers that are more environmentally friendly. This transition to PET has highlighted the importance of working with partners who can ensure both the environmental benefits of PET, plus the critical performance characteristics that enable packaging to possess required attributes such as clarity, long-term ability to preserve freshness, and reliable maintenance of shape during transportation. 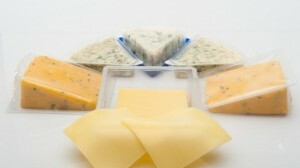 By way of example — FrieslandCampina, one of the world’s five largest dairy companies; Südpack, an innovative producer of film packaging for food; and OCTAL, a global leader in PET resin and sheet — have joined together to create a unique packaging solution for cheese. FrieslandCampina was motivated to replace the existing bottom sheet for its cheese packaging with material that is recyclable but also stronger than the laminated APET/PE structure previously in use. Südpack was driven by production requirements for a material that met or exceeded the demanding specifications of its Form Fill Seal (FSS) technology — packaging systems that form, fill and seal a package on the same machine. OCTAL provided the packaging material solution that met the objectives of both FrieslandCampina and Südpack. OCTAL DPET™ (direct-to-sheet PET) provided greater strength than laminated APET/PE with the added benefit of being 100% recyclable, thereby reducing the amount of packaging that can potentially enter landfills. Moreover, OCTAL DPET™ increased the integrity and performance of the packaging. DPET™ sheet combines sustainability and product performance; high consistency, easy forming, high machine output, and good aesthetics.OCTAL’s DPET™ is the first and only direct-to-sheet polyester sheet in the world. OCTAL’s unique direct-to-sheet process, DPET™ technology eliminates five energy intensive stages of the conventional sheet production process (pelletizer, SSP, compactor, dryer and extruder). This exclusive technology produces PET sheet characterized by enhanced optical and mechanical properties, increased productivity for thermoformers, and environmental advantages. Through proprietary software programs and process control technology, OCTAL maximizes roll-to-roll product uniformity bringing a range of advantages to the PET industry. Barenberg says he believes more companies will convert to PET once they discover optimized partnerships such as the one created between OCTAL, FrieslandCampina, and Südpack.